The history of Hemel Hempstead Town FC is a complex past, with mergers between local clubs and numerous name changes before finally settling as the club as it is known today. Of the clubs that merged over the years to form the club as we know it today, the history of Apsley FC goes furthest back. Formed in 1885 as Apsley End FC, the club was based at Salmon Meadow and played in a claret and blue strip. The first record of competitive football was in 1889, when the club entered the Herts Senior Cup. Apsley End were then one of the founding member clubs of the West Herts Football Association and entered their first league competition in 1891/92, before changing the name to just Apsley FC two years later. 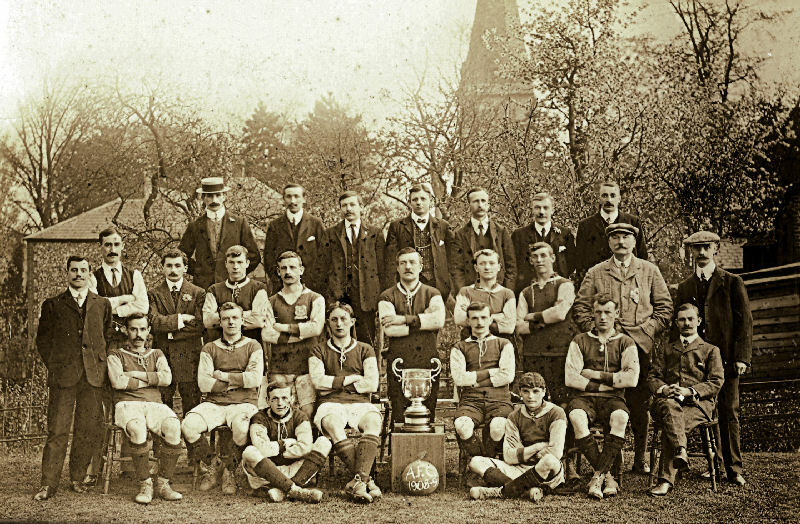 Apsley won the Division One championship in 1894/95, the first honour in the clubs history. Around this time, many clubs competed in more than one league at a time; small numbers of competing clubs meant that entering more than one competition would allow the clubs to play more regularly. Apsley also competed in the Wolverton League and the Herts County League, entering the latter as a founding member club in 1898/99. Apsley were one of the more successful local teams competing in the Herts County League either side of the fist World War, winning three league championships along with many other high league finishes. In 1922, Apsley left the Herts County League to join the Spartan League. Apsley competed in the Spartan League for 30 years, during this time the club moved home twice, first to Gee’s Meadow in Bourne End for one season, before moving to the new Wood Lane Ground, more commonly known as Crabtree Lane where the club remained until 1972. Whilst in the Spartan League, Apsley claimed three runners up spots in the lower divisions, there was a Division One championship place in 1933/34, but the club failed to make an impression in the Premier Division and were soon relegated. Apsley were one of 29 clubs who rejoined the Spartan League in the season immediately following the second World War, the club showed a great improvement in form and consistency at this time but again only had a couple of runners up spots to show for it. The clubs name changed to Hemel Hempstead Town, it had been some time now since the club had actually been based in Apsley, and following promotion to the Spartan Premier League for the 1951/52 season, the club left to join the Delphian League. Hemel didn’t set the Delphian League alight, finishing in the bottom two of the division on five occasions during eleven seasons. The clubs best finish in the Delphian League was as runners up in 1961/62, this success was unable to be built upon as the following season continuous poor weather caused the Delphian League to be abandoned after Hemel had played twelve games. An emergency competition was organised giving Hemel a further eight fixtures, however the Delphian League disbanded once the season finished in 1963 and the clubs formed Division Two of the Athenian League. In January of 1962 the attendance record at Crabtree Lane was set when 3,500 spectators paid to watch the first time the club had played in the First Round Proper of the Amateur Cup, Hemel lost 1-3 to Tooting & Mitcham after missing two penalties. In their opening season in the Athenian League, Hemel finished fifth in Division Two and were subsequently promoted to Division One due to restructuring. In 1964-65 Hemel finished as runners up in Division One, winning promotion to the Premier Division. Hemel only lasted three seasons in the Premier with a best finish of ninth in 1966 before two consecutive relegations saw Hemel start the 1969/70 season in Division Two, a level which Hemel remained for nearly 30 years! 1962 and 1966 saw Hemel reach the final of the Herts Senior Cup but Hitchin Town then St Albans City kept the trophy from Hemel’s grasp. In 1967 Hemel reached the final of the Herts Charity Cup for the first time, losing 0-1 to St Albans City. During this period Hemel also reached the final of the Herts Charity Shield five times, although only won in 1964. In the summer of 1972, Hemel Hempstead Town merged with Hemel Hempstead United, the new club took the simple name of Hemel Hempstead and made United’s Vauxhall Road ground as its home. With ground moves, mergers and (almost all of) the name changes out of the way, the club as we know it was born. Hemel remained in the Athenian League for a further six seasons, during that time it was only the last two seasons Hemel shone with two consecutive fourth place finishes. In the FA Cup during this period, Hemel failed to get past the First Qualifying Round. In 1976 Hemel again reached the final of the Herts Charity Cup, this time losing 0-4 to Hitchin Town. Six Herts Charity Shield finals beckoned over the forthcoming years, but The Tudors were only victorious in 1977 and 1984. In 1977, Hemel left the Athenian League to join the rapidly expanding Isthmian League, who boasted to be the south of England’s premier football league. Hemel joined the Isthmian League in Division Two, and this was a level the club struggled to progress from. Mid-table mediocrity was the norm for many years and numerous restructuring failed to kick start The Tudors – shuffling to the Isthmian League Division Two North in 1984, then back to just Division Two again in 1991. Hemel managed to finish in the top half of the table just seven times in twenty five years, with the best efforts during this time being three finishes in fourth place – in 1976, 1977 and 1993. 1993 was the closest Hemel had been to promotion, missing out by two points to local rivals Berkhamsted Town who clinched third place and the last promotion spot. Only the previous season Hemel had fought bravely against Barnet in the Herts County Senior Cup final, losing 4-1, although the score line doesn’t sound generous towards Hemel, it was superior fitness and three late goals and which clinched it for the Football League Division Four side. It was downhill from there, in November 1992 Hemel’s Vauxhall Road ground was rocked by fire, the destroyed clubhouse and changing rooms were replaced by temporary structures, which remained for over five years. 1996/97 saw The Tudors concede 125 goals, score only 34 (an average of less than one goal per game!) and finish rock bottom, relegation to the Isthmian Division Three loomed. This was only the fifth time in 112 years the club had suffered relegation. The last ten years has been very eventful for Hemel with various ground improvements, 2 league championships, a play-off final win, two automatic promotions, promotion through restructuring, and a relegation, not to mention seven changes of manager. The first tasks of the new Committee which gained control of the club in 1997 were to change the name back to Hemel Hempstead Town FC, then to install successful Leverstock Green manager and ex-Hemel captain Mick Vipond as manager. The result was a quick promotion with Hemel winning the Division Three championship at the first attempt, conceding only 28 goals that season and scoring 86, quite a turnaround from the previous season. This was the first league championship the club had won since 1934. After a stuttering start to Division Two, Hemel parted company with Vipond in December 1998 and ex-Watford star and 1985 FA Cup finalist Neil Price was appointed as manager. Price guided the Tudors to 4th place and bettered this the following season when Hemel won the Division Two championship, only to be denied promotion due to insufficient ground grading. In this championship season Hemel conceded just 27 goals in 42 league games, the best defensive record in the clubs history. Hemel followed this up with a 6th place finish and in the summer of 2001 Price was replaced at the helm by former Barnet goalkeeper Gary Phillips. By this time various ground improvements had led to a “B” grading for Vauxhall Road which made the club eligible for promotion. Hemel failed to find their feet in the 2001/2002 season and following the resignation of Phillips after a 6-1 defeat at the hands of Chertsey, ex-Hemel player Tony Kelly was appointed as manager. Following another 6th place finish, restructuring saw Hemel leave the Isthmian after nearly 30 years of competing in that league and for the first time Hemel started a season in the Southern League, competing in the Premier division. It was never going to be easy settling in the new league but Hemel struggled, with Kelly being replaced by ex-Arseley manager Nicky Ironton in November. Just 3 wins in 12 games saw Hemel slide in to the relegation zone and Ironton was replaced by Hemel’s 3rd manager of the season Byron Walton, who inherited a side 10 points from safety with 12 games to go. A short unbeaten run was not enough and Hemel were relegated to the Southern Western Division. Hemel began to slip in 2005/2006 and Walton was replaced by ex-Hemel player and former Chesham and Berkhamsted manager Steve Bateman. A nail biting end to the season saw Hemel beat Brackley Town in the play-off final to secure promotion back to the Southern Premier Division at the first attempt. Last season, 2006/2007, saw Hemel achieve a play-off position which could have seen the club promoted to the Conference South. However, the play-off semi-final away to Team Bath resulted in defeat. The Tudors had to settle for finishing the season with four cup final appearances, the Errea Cup, Herts Senior Cup, Herts Charity Cup, and the St Mary’s Cup. Victorious in one of those competitions, the St Mary’s Cup were brought home to Vauxhall Road in a 3-2 win over local rivals Berkhamsted Town. In 2008/09, Hemel started brightly and by Christmas the club was in a play-off position having just beaten league leaders Farnborough. Former star striker Anthony Thomas returned to Vauxhall Road and things were looking good for the Tudors. However, a poor start to the New Year led to the sacking of Steve Bateman on the 16th February, the eve of the clubs appearance in the final of the Herts Charity Cup. The next day, Hemel beat Ware 2-1 to lift their first silverware of the season and former Celtic and Southend midfielder Paul Byrne was appointed as Bateman’s successor. A good start under Byrne was followed by inconsistent form; however Hemel fought their way in to the play-offs, with Thomas again finishing as the clubs top scorer as he overtook Hugh Boycott-Brown as the clubs all-time leading goal scorer. The Tudors lost the play-off semi-final on penalties at Farnborough. By the start of the 2009/10 season, Byrne had been replaced at the helm by Dennis Green, but the club was not on good form and he was replaced in October the season by Gary Philips, who was himself replaced in March by Dean Brennan. Hemel still ended up in a relegation position but were spared going down by the requirement of restructuring. Hemel finished the season with a St Mary’s Cup final win over Oxhey Jets. During the summer of 2010, Hitchin manager Colin Payne was appointed the new Tudors manager in time for the 2010/11 season which saw the Tudors celebrate their 125 years in existence. The season started well but inconsistent form saw Hemel finish 15th in the league. Payne led the team in to the 2011/12 however with Hemel firmly attached to a relegation position he was replaced in October by former Salisbury manager Tommy Widdrington. Despite the team not enjoying much better form under Widdrington, there was at least a slow progress so it was a great disappointment to the club when he left his position after just four months to take up a job at Eastbourne. Mark Eaton and Alan Biley formed a partnership to manage the Tudors however their best efforts could not pull the club to safety and relegation loomed after finishing 19th. Reprieved from relegation, Hemel appointed Dean Brennan for his second spell as manager for the 2012/13 season. Brennan brought in a lot of new faces in to the squad and after a flying start to the season Hemel found themselves top of the league table, where they spent a total of 19 games before a dip in form saw eventual champions Leamington take over. Hemel finished the table in a club record fourth place and made it to the play-offs, facing third place Chesham United in the semi-final. Hemel won 0-2 at Chesham and set up a home tie against Gosport Borough in the final. 2254 eager fans packed in to Vauxhall Road to watch the game that was to decide Hemel’s fate; Gosport went 2-0 up in the first half but Hemel fought right to the end and scored 2 late goals to draw level. After a goal-less extra-time, Hemel lost on penalties. Hemel did gain some silverware though, winning the Herts Senior Cup for the first time since 1926, beating Potter Bar in the final. Hemel’s last honour this season was the Sir Stanley Rous Memorial Trophy, awarded by the Herts FA to the club or individual that has brought the most prestige to Hertfordshire. 2013/14 was a fantastic season for Hemel. The Tudors got off to a flying start, despite losing the opening league game at Hitchin, Hemel went on to win ten consecutive games and went on to spend the majority of the season well clear at the top of the Southern League Premier Division league table. Hemel were also in the draw for the FA Cup First Round proper for the first time since 1938 after drawing 3-3 with Conference South high fliers Sutton United, but unfortunately lost the replay. With just the league to concentrate on, Hemel went on to break records with striker Ben Mackey scoring a club record 43 goals in all competitions and 'keeper Laurie Walker keeping the most clean sheets by a single goalie in Hemel's history. The Tudors had the Southern League's highest average attendances and Vauxhall Road entertained nearly two thousand fans against both St Albans City and Chesham United. It was at home to Chesham on Easter Monday that Hemel lifted the Southern League Premier Division winners shield, having secured the championship away to Hungerford two days previously. It was the start of a whole new era for Hemel Hempstead Town FC in August 2014, the clubs first season in the second tier of the English non-league game. The Tudors first ever game in the Conference South was an away win at Basingstoke Town, however stuttering form during the seasons early stages led to numerous changes of playing personnel, with some of the previous seasons championship winning side leaving Vauxhall Road to make way for some more experienced players and some young professionals loaned from some of the area’s leading clubs. Hemel’s form improved as the season developed and the club was still capable of reaching the play-off’s within a few weeks of the season ending. A respectable 9th place finish was accompanied by cup final wins in the Herts Senior Cup and the St Mary’s Cup, while club record runs were achieved in the FA Cup (first round, losing away to League Two Bury) and FA Trophy (third round, losing at home to National League Torquay United). In 2015/16, inconsistent form and many injuries saw The Tudors exit all the cups early on and at one stage there was a threat of a relegation scrap – however fantastic late season form saw another record finish, sixth in the table, with defeat at home to Whitehawk on the final game of the season seeing our visitors secure the final play-off spot over us. During the season, the management team of Dean Brennan and Stuart Maynard became the longest serving Manager(s) at Hemel for thirty years. The 2016/17 season was a significant one at Vauxhall Road, as it was the twentieth season Chairman Dave Boggins led the club as Chairman. On the pitch, the momentum gained in recent seasons slowed down, with inconsistent form during the opening stages of the season making a push for promotion highly unlikely by the halfway stage. There were also quick exits from the major cup competitions. However, the return of former captain Jordan Parkes and the recruitment of some key players via loan signings led Hemel on a mid-season charge up the table, at one stage being the division's form sides as the play-off’s became an achievable target. The change in fortunes didn't last though, and as form dipped in the latter stages, The Tudors season resulted in a 12th place finish - lower than expected but not unreasonable for a club still establishing itself at this level of the game. The Tudors bounced back in 2017/18, in a season which saw the National League South increase play-off positions to the second to seventh placed sides in the final league table. With the prospect of a play-off position much more achievable, a competitive season saw many clubs fancying their chances at promotion. Despite some inconsistent form, a more settled Hemel squad than previous seasons did well enough to spend much of the season in the play-off’s and even in the latter stages of the campaign automatic promotion was still with sights. Eventually, a new club record finish of fifth place in the National League South secured a home play-off “elimination” tie (effectively a “quarter-final) against Braintree, who beat Hemel on penalties on their way to winning the play-offs. The Tudors reached the final of the Herts Senior Cup this season but conceded the final against Hitchin Town, due to Hemel staffs concerns about the safety of their players on the playing surface of the neutral venue. This season also saw landmark appearances for Tudors players Jordan Parkes and Kyle Connolly who each reached 200 appearances for Hemel, whilst the management team of Dean Brennan and Stuart Maynard took charge of their 300th game.